The Census Bureau reported yesterday that the homeownership rate in the U.S. fell to 65.9% in the second quarter of 2011 (see chart). That’s the lowest homeownership rate in slightly more than 13 years, since the 66.4% rate in QIV of 1997. Compared to the all-time peak of 69.2% in 2004, America’s homeownership rate has now fallen by more than three percentage points. 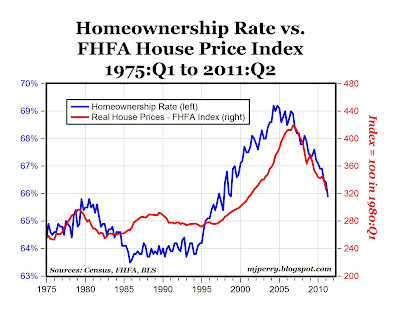 The chart above also displays inflation-adjusted house prices, using the Federal Housing Finance Agency house price index. After several decades of relative stability in real home prices (index stable around 280) and homeownership rates (between 64-65%) between 1975 and 1995, both series rose over the next decade to unprecedented record-high levels. By 2004, the homeownership rate had risen to 69.2% from 64% in 1994, and real home prices appreciated by more than 50% between 1996 and 2006. That huge run-up in home prices created an unsustainable real estate bubble that started crashing in 2007, leading to a 22% drop in home prices through the first half of this year and bringing real home prices back to their 2001 levels. Likewise, the unsustainable “homeownership bubble” started crashing in 2007 and homeownership rates are now below 66% for the first time since the late 1990s. Did you just become a pessimist? After dozens of postings about how housing looked to be improving you finally resort to the reality. The huge run up in home prices was supported by extremely low interest rates needed to keep the broken wage stagnant economy growing after the recession of 2001-2. 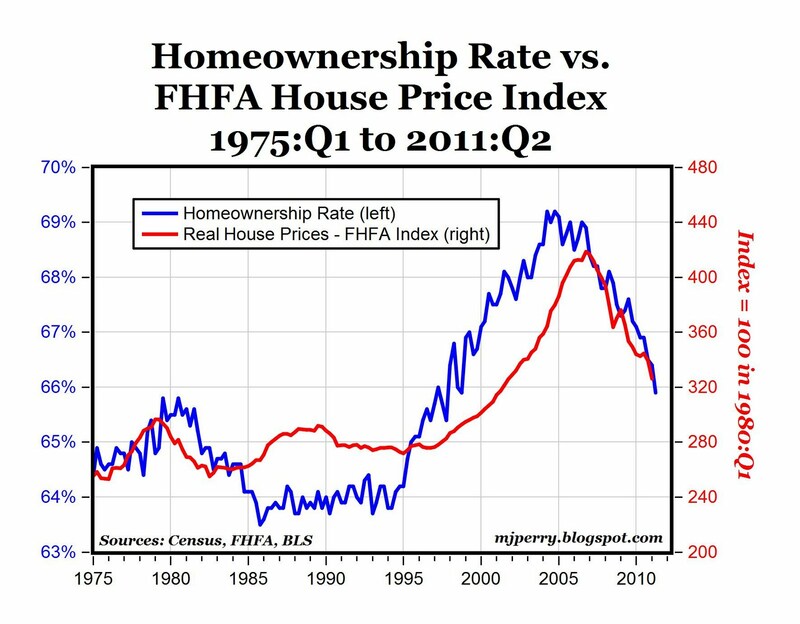 Had the housing bubble never occurred the economy would still be stuck in the mud because of decreased savings, increased debt, stagnant wages and decreased demand resulting from shipping our manufacturing overseas and arbitraging our society with that of communist countries. This is a great economy for billionaires and their Vassalships like the Cato institute but if you step outside the castle you will see the hoards gathering at your gates. While it's true that low interest rates helped to fuel the housing boom, there is little evidence that in the absence of a government imposed reduction in lending standards that lower interest rates alone would have produced the housing bubble. Having to come up with the standard 20 percent down payment becomes more difficult as housing prices rise helping to cool the market and to insure that buyers are not merely speculating but are committed purchasers. The government through it's actions mitigated that effect. Arbitraging our society with communist countries? Which ones? No other country imposed entitlement programs - deliberately structured as Ponzi schemes - on the US. No other country created the costly regulatory overhead or the convoluted tax code. No other country is responsible for the failing government run public school monopoly or the heavy union influence on our political process. If such an arbitrage ever existed, it was made possible by the malignant decisions of our own ruling class whose only real concern seems to have been purchasing the political support of one group of Americans with the money of another. Of course, the other problem with your argument is that while cash wages may have leveled off, total compensation, including benefits, did not stagnate during this period. Workers simply received more of their compensation in the form of heal care, etc. Too bad I can't print charts. But if you go t this link, you will see commercial property values tumbled about in half in the property bust--even worse than many housing markets. Of course, there is no Fannie and Freddie involvement in the commercial property market sector, and CMBS are bought freely by private "sophisticated" investors. So, Dr. Perry--what explains the commercial property bust, if Fannie and Freddie were such key players in the residential bust? What is more likely is that we had a classic property bust. magnified by a Fed tight money policy. That said, I would like to eliminate Freddie and Fannie and the home mortgage tax deduction. It's not surprising, since homebuilding remains at 20% capacity, with other massive idle resources. Americans will own less.